2I Feel Uneasy Sitting in Front of the Mirror – Why? Mirror work is strangely confronting, undeniably intimidating, a little embarrassing … but also profoundly healing. Of all the inner work practices available to us in the 21st century, mirror work is one of the simplest and most powerful. No, you don’t have to go out and splurge money on loads of spiritual or self-help paraphernalia (thank god) – all you need to do mirror work is a mirror – that’s it! And nearly all of us already have access to one. If you’re looking for a new psychological or spiritual tool to add to your repertoire, look no further than your bathroom mirror. Mirror Work was a method originally developed by inspirational teacher Louise Hay as a way of getting in touch with the inner self. The primary purpose of mirror work is to develop self-love, self-care, and a more meaningful relationship with others. 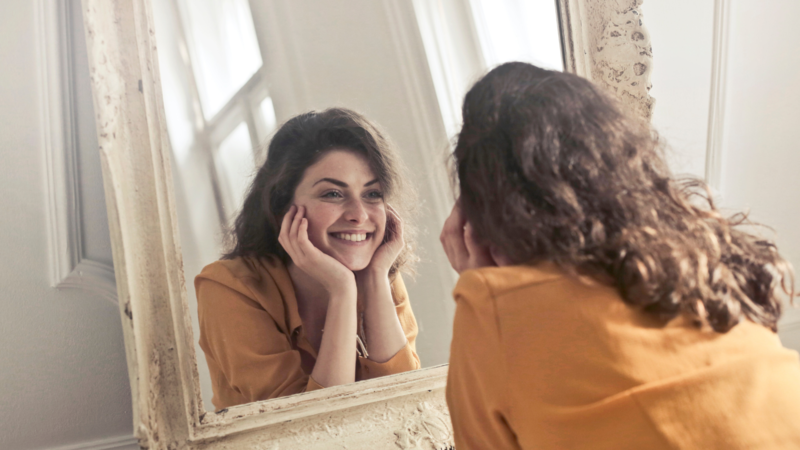 By simply looking into the mirror for a certain amount of time each day and gently talking to yourself, you can foster a more compassionate and forgiving connection with yourself. I Feel Uneasy Sitting in Front of the Mirror – Why? Go sit or stand in front of the mirror in your house for five minutes. Simply stare at yourself and hold eye contact. That’s all you have to do. If you’re like most people, you will feel uncomfortable. You may feel awkward, unsettled, embarrassed, emotional, or other feelings like self-loathing and criticism arise. The mirror reflects back to you the feelings you have about yourself. It makes you immediately aware of where you are resisting and where you are open and flowing. It clearly shows you what thoughts you will need to change if you want to have a joyous, fulfilling life. In other words, in front of the mirror, there is no hiding. In front of the mirror, we catch an intimate (and sometimes painful) glimpse into the relationship we have with ourselves. Mirror work can make us feel initially uneasy because it exposes our inner critic in plain daylight. Suddenly everything we feel about ourselves that we might not be aware of comes to the surface. And if you haven’t developed a compassionate relationship with yourself, you might be prone to believing all the nastiness whispered by your inner critic. Another reason why mirror work can make us uncomfortable is that it exposes vulnerable parts of our inner selves. 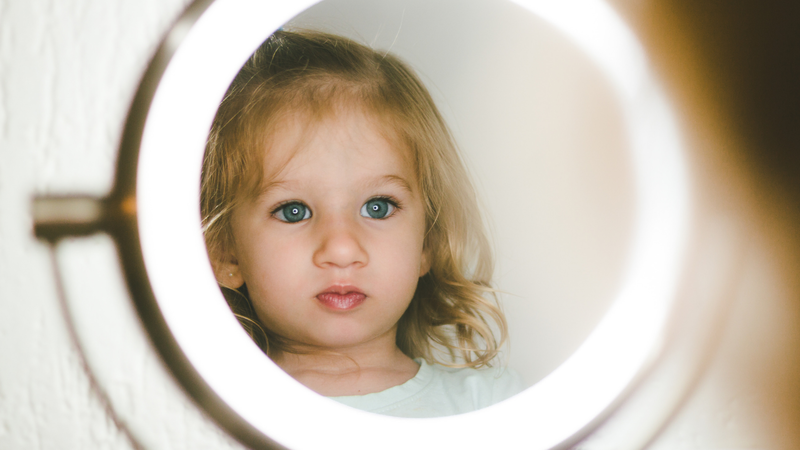 Most notably, mirror work can bring us face to face with the child within us. We all possess an inner child – it is one of the many archetypes (or forms of energy) that compose our personality structures. When looking into the mirror, it’s not unusual to feel waves of sadness wash over you. I know that when I’ve experienced this despondency, it has been from my inner child pleading for my attention. But although looking into the mirror can be upsetting at times, these feelings point to deeper work that is happening. Simply gazing at yourself in the mirror and comforting your inner child can be a tremendously healing practice. The more emotional you feel, the more emotional purging and transformation are happening. The eyes are the mirrors to the Soul as the old saying goes, and mirror work gives you direct access to that deeper part of you. But first, the inner work must happen. Connecting with your Soul doesn’t always happen immediately during mirror work – although it can. Typically you will need to work through your insecurities and self-resentments by practicing self-love before you can feel and sense your deeper inner presence emerge. But how do you know that you’re reconnecting with your Soul? I can’t answer that question for everyone. But for me the presence of my Soul emerges when my face softens, my eyes become warmer and more compassionate, a slight smile enters my face, and a lighter form of energy fills my body. Feeling drawn inwards is also another sign. As magical or mystical as it may sound, using mirror work as a portal to your Soul is actually quite natural. There is nothing phantasmagorical about it – it feels like returning home to the truest, most whole, and wisest part of yourself. There are no official methods of doing mirror work – although you can try the 21-day practice developed by Louise Hay in her book. Mirror work creates the deepest changes when it is done consistently over a long period of time. I recommend dedicating a minimum of five minutes a day, with ten minutes or more being ideal. 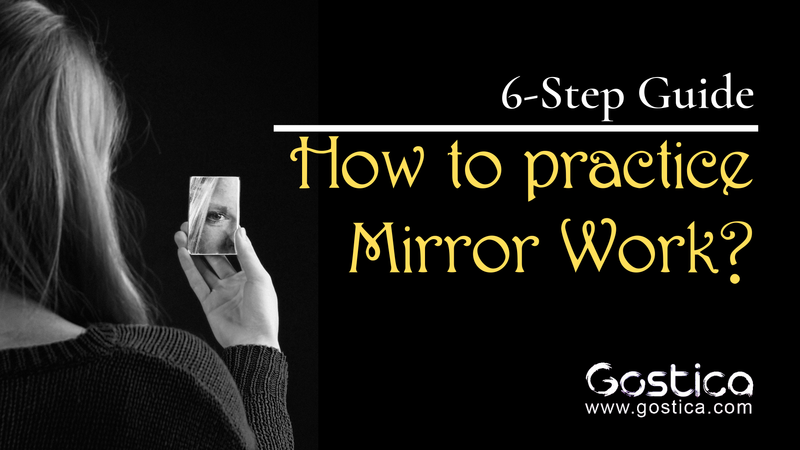 Mirror work is flexible and can work around your schedule. Most people like doing mirror work in the early morning and late at night before going to bed. You can also do mirror work during the day as you pass mirrors. If there are no mirrors in your workplace, you can always use the selfie option on your phone (where you turn the camera towards yourself). You can find a private spot (such as in a bathroom cubicle) to do this exercise while at work. Why use affirmations, you might ponder? Affirmations counteract the negative self-talk that runs through our heads – they also help to reprogram our minds. When we use affirmations, we are affirming something that we like about ourselves or something positive we wish to give ourselves. You may like to create your own affirmation spontaneously based on how you feel when you look in the mirror. For example, if you feel ugly in that moment of time, you can affirm to yourself, “I have a beautiful heart and soul” or whatever feels most authentic to you. A note on affirmations: If you are creating your own affirmations, please ensure that you keep them phrased in a positive way. Many practitioners who work with affirmations (such as those who study NLP) assert that the unconscious mind does not understand negatives and will translate any negatively phrased affirmation in reverse. Whether out loud or in your head, repeat your affirmation to yourself at least ten times. Louise Hay recommends at least 100 times – but that can seem overwhelming at first. Certainly, the more you repeat your affirmation with sincerity, the deeper impact it will make. So try to set a realistic number and stick to it. You can always increase the number of times you say your affirmation while looking in the mirror as you progress through your practice. It’s normal and okay to feel upset. If you feel the need to cry, let yourself – you are releasing old ways of being, and that is powerful work! You may also wish to give yourself a hug, which is also wonderfully therapeutic. It’s likely that you will feel emotional at some point and that is because the old frozen pain within you that has built up through the years is bubbling to the surface. Sometimes the emotions we feel during mirror work are from childhood, particularly if they are intense. If this is the case, comfort your inner child by acknowledging it within you as you look at the mirror. You may wish to say words such as, “It’s okay, I see you, I understand,” “I’m here for you,” “I love how brave you are little [insert name],” etc. A note about men doing mirror work: Feeling and expressing emotions will likely be more difficult for men than for women. Why? Men are conditioned to perceive being stoic as a true measure of manliness – but the truth is that “stoic” is just another word for emotionally distanced and repressed. There is nothing courageous about avoiding emotions. If you are a man, you will need extra reassurance and compassion through this stage of the work. Have some deep affirmations on hand and the willingness to see your emotional openness as true strength. It is important during the course of your mirror work to keep a journal. You don’t need to write long paragraphs about your experiences if that doesn’t suit you – simply write a sentence or two. Record how you feel (even if that means expressing how silly you feel) and what came up. You don’t need to keep a mirror work journal every day, but please ensure that you write down whatever notable experiences you’ve had. Any new emotions, thoughts, discoveries or breakthroughs should be recorded. By keeping a journal, you will be able to track your evolution and progress. Mirror work is deceptively simple but tremendously empowering. So much healing work can be done by simply looking at yourself in the mirror and expressing self-loving affirmations. One of the most amazing side benefits of mirror work is how it impacts your relationships. By developing more self-love, life becomes more harmonious and your connections with others can improve significantly. It’s true that love for self equals love for others. But you don’t have to believe me – try mirror work yourself! If you have dabbled with this fascinating tool or are a loyal advocate, share with me your experiences. What part of mirror work is the most difficult for you? How do you overcome those difficulties?